Russia: Metrojet Flight 9268 crashed because of terrorist bomb; ISIS not named. 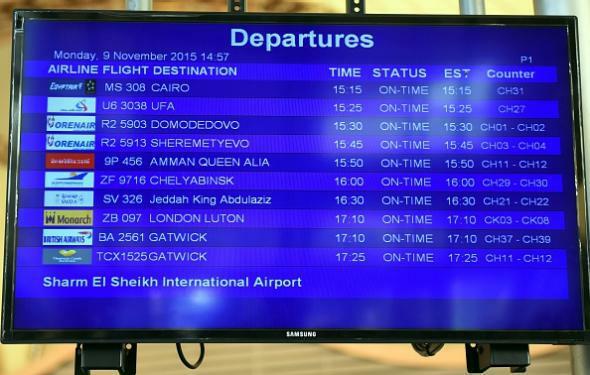 A photo of Egypt’s Sharm el-Sheikh Airport’s departures board taken on Nov. 9, 2015. On Tuesday, after hedging for 17 days, Russian officials acknowledged that the passenger jet had been downed by a bomb. “We can say definitely that this was a terrorist act,” Alexander V. Bortnikov, the head of the Federal Security Service, or F.S.B., said in remarks to Russia’s Security Council Monday night that were broadcast nationally on Tuesday morning. Egyptian officials, at this point, are the only notable holdouts from the consensus that the flight was downed by terrorists; several outlets report that the Egyptians are concerned about the possible loss of tourism income that would result from admitting that their security forces failed to stop an attack.